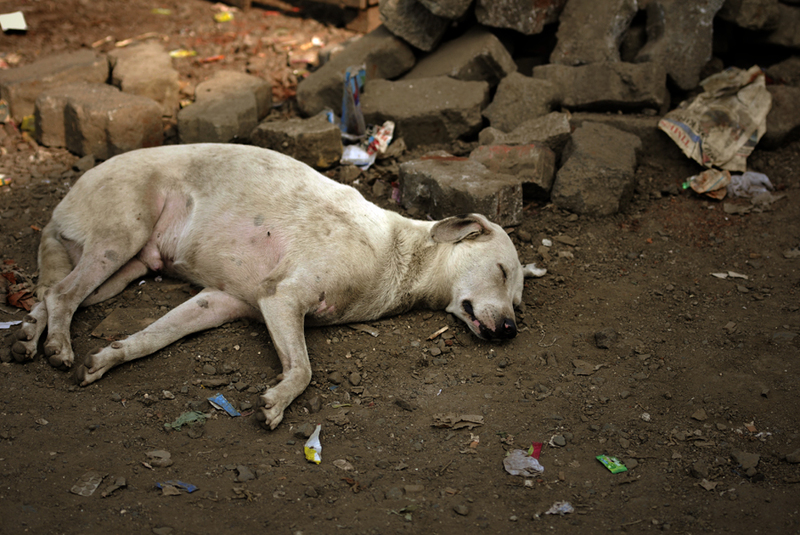 In this fifty-second archive story by Kristian Bertel, we see one of the many street dogs sleeping in Mumbai, India. Street dogs are known as free-ranging urban dogs or urban free-ranging dogs and they are unconfined dogs that live in cities. They live virtually wherever cities exist and the local human population allows, especially in the developing world such as India. Street dogs may be stray dogs, pets which have strayed from or are allowed freedom by their owners or may be feral animals that have never been owned. Street dogs may be stray purebreds, true mixed-breed dogs, or unbred landraces such as the Indian pariah dog. Street dog overpopulation can cause problems for the societies in which they live, so campaigns to spay and neuter them are sometimes implemented. They tend to differ from rural free-ranging dogs in their skill sets, socialization, and ecological effects. Barking and howling and dog fights over mating among dogs can be very disturbing to people, and the smell of dog urine which is an unsavory product of territory marking can become quite pungent, especially among unspayed or neutered dog. To survive, street dogs need to avoid conflict with humans. However, dog bites can occur when dogs are trying to mate or fighting among themselves, and pedestrians and other humans in the vicinity may be bitten by fighting dogs. In addition, females with pups are often protective and may bite people who approach their litter. Dogs are known to be a highly adaptive and intelligent species. To survive in modern cities, street dogs must be able to navigate traffic. Much of the urban stray population consists of mongrels or mix-breeds, who are descended from pure-breed dogs who have been allowed by their owners to interbreed with pariahs. The size of stray dog populations always corresponds to the size and character of the human population of the area. Some of the stray dogs in Mumbai are seen crossing the large streets at pedestrian crosswalks. The dogs have probably noticed that when humans cross streets at such markings, cars tend to stop. The dogs have accustomed themselves to the flow of pedestrian and automobile traffic, where they sit patiently with the people at the curb when they are stopped for a red light, and then cross with them as if a daily routine. As a result of the virtual extermination by the veterinary drug diclofenac of the vultures which formerly ate animal carcasses and well as dead humans, urban India has two features which create and sustain street dog populations. Large amounts of exposed animal carcasses, which provide an abundant source of food, and a huge population of slum and street-dwellers whose way of life includes keeping the dogs as free-roaming pets. For instance, Mumbai has over 12 million human residents, of whom over half are slum-dwellers. At least five hundred tons of garbage remain uncollected daily. Therefore, conditions are perfect for supporting a particularly large population of stray dogs. India has the highest number of human rabies deaths in the world, which is estimated at 20,000 every year. The term 'pariah dog' has been used inconsistently, but is sometimes used synonymously, if incorrectly, with free-ranging dog. Originally, it referred to the landrace of free-ranging dogs native to India and other Asian countries. It later came to be used for primitive natural breeds of dogs of a similar physical appearance in other parts of the world. Primitive dogs are distinctive, local, free-ranging landraces. Breeds recently developed from naturally selected populations and very ancient breeds. Pariah dogs are canines that have kept close to the original form and have evolved with little or no purposeful human intervention. Pariahs in all countries tend toward a very similar. Typically, these canids have a spitz-like appearance. A wedge-shaped head with a pointed muzzle, almond eyes, erect ears, and a long, tail curved over the back. Unlike modern breeds, pariah dogs have one annual estrus cycle. People sometimes distinguish between stray dogs and feral dogs. Stray refers to lost and abandoned pets, or others that had socialized to humans before taking to the free-ranging life and feral to dogs that have lived all their lives apart from people. This distinction is important to them, because stray dogs can be relatively easily taken into captivity, whereas feral dogs are more fearful and difficult to keep as pets, and so are more often captured, spayed or neutered, and released back into the parks, vacant lots, and other hiding places on the margins of human society where they are most commonly found. Feral 'wild animal' implies the animals that have run wild or having escaped from domestication. Feral dogs include the second generation offspring of former strays which, having had little or no contact or bonding with humans, may have formed pack communities and reverted to instinctive canine behaviors. They may scavenge for food on the periphery of human populations. India is a land full of stories. On every street, on every corner and in the many places in India, life is rushing by you as a photographer with millions of stories to be told. In the archive story above, you hopefully had a readable insight in the story that was behind the photo of a street dog in Mumbai. On this website of Kristian Bertel | Photography you can find numerous travel pictures from the photographer. Stories and moments that tell the travel stories of how the photographer captured the specific scene that you see in the picture. The photographer's images have a story behind them, images that all are taken from around India throughout his photo journeys. The archive stories delve into Kristian's personal archive to reveal never-before-seen, including portraits and landscapes beautifully produced snapshots from various travel assignments. The archive is so-far organized into photo stories, this one included, each brought to life by narrative text and full-color photos. Together, these fascinating stories tell a story about the life in India. India, the motherland to many people around the world, a land of unforgetable travel moments. The archive takes viewers on a spectacular visual journey through some of the most stunning photographs to be found in the photographer's archive collection. The photographer culled the images to reflect the many variations on the universal theme of beauty and everyday life in India. By adding these back stories the photographer's work might immensely enhanced the understanding of the photographs.